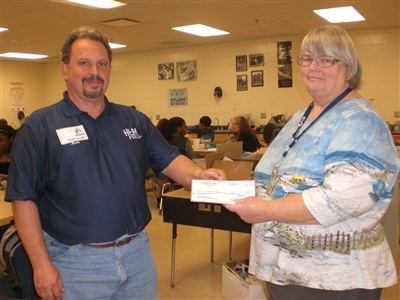 Mark Geallis of Halifax Urban Ministries, which targets hunger and homelessness in the Volusia County area, accepts a check from Marcia Bobbitt of Mainland High School for more than $14,500 raised during the community's recent Empty Bowls event. Photo from Halifax Urban Ministries. DAYTONA BEACH -- The final tallies are in, and Halifax Urban Ministries' annual Empty Bowls fundraiser in December raised about $18,200 to help meet the needs of the homeless and those at risk of living on the streets. Several United Methodist churches in the East Central District, which stretches to Volusia and Flagler counties at its northern boundary, support the ministry of the nonprofit organization known as HUM with donations and volunteers. HUM leverages this support to attract business sponsorships and efforts like Empty Bowls, a partnership with Volusia County Schools' art departments and Mainland High School's Culinary Arts Institute. The fifth annual Empty Bowls Event and Silent Auction was held at Mainland High and attracted about 800 community members. To raise money, the arts institute served meals in handcrafted bowls and 15 local restaurants donated soup. That effort raised more than $14,500, and corporate donations from Cobb Cole, Florida Power & Light and Regions Bank pushed the proceeds higher. HUM spokesman Mark Geallis said the amount raised is enough to do one of the following: provide up to 2,300 Feed-a-Family bags or 90,000 hot meals or meet the needs of 18 families in HUM's homeless shelter for a month. For information about HUM, visit www.HalifaxUrbanMinistries.org.